When I go to a family get together I will usually make this dish in a 13×9 inch pan because it is easier to take in the car. But when I am making it to serve in my home I like to make it in individual cups because it is so much prettier! 1 3/4 cups crushed chocolate cookie crumbs – this took me about 2 sleeves of chocolate cookies with filling removed. 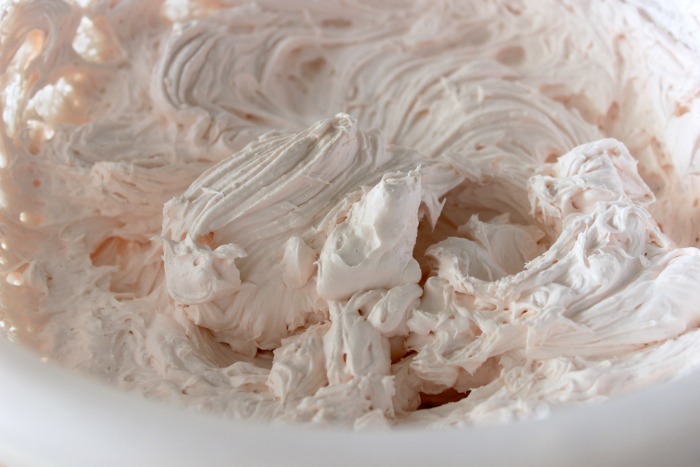 I was able to find the Strawberry Cream Cheese at my Walmart – it was pretty easy to find along side the other cream cheeses. Here are the new flavors with more fruit and veges! I like to make the filling first so it has time to set. Mix together the sugar and cornstarch. Place in sauce pan and add the water. Stir so everything starts to dissolve and so there are not any lumps. Bring to high and constantly keep stirring. Bring to a boil and keep stirring until the mixture gets thicker. This takes about 1 minute. Remove from heat and stir in the Jello package and stir until dissolved. I place the mixture in the freezer for a quick cool down (and thickening) while I start working on the strawberries. Wash all the strawberries and then slice. 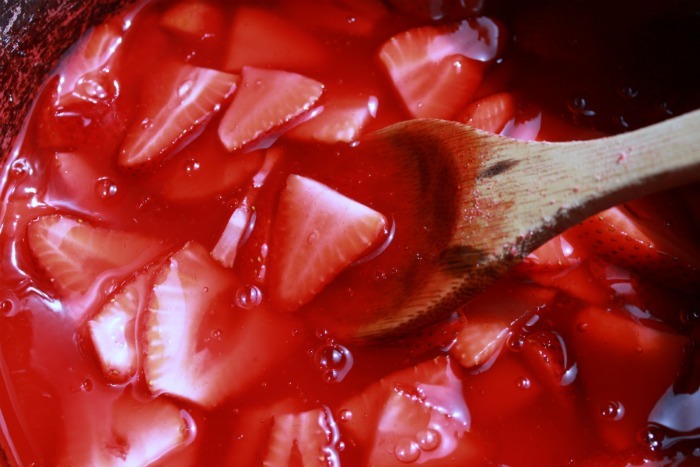 Add the strawberries to the Jello mixture and return to freezer. Now we will work on the crust. Crush your chocolate cookies into crumbs. You should have about 1 3/4 cups of cookie crumbs. Add the softened butter. Mix until crumbly. I usually serve this dessert in a 13×9 inch pan – when I do that I press 3/4 of the crumb mixture into the pan to form a crust – reserving the rest of the crumbs for the topping. Or if you plan on serving in individual cups then you press some of the mixture into the bottom of the cups. 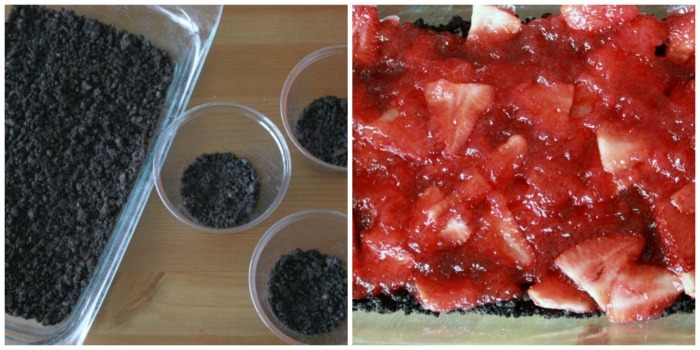 Pour the strawberry mixture over the crust and put in fridge. Next we are going to make the yummy topping. Stir together the Cool Whip, Strawberry Philly Cream Cheese and 1/2 cup powdered sugar. Whip together with your mixer until everything is combined. Doesn’t this look delicious!! So yummy with the little pieces of strawberries from the cream cheese! I think this would make a yummy fruit dip as well. #SpreadTheFlavor! 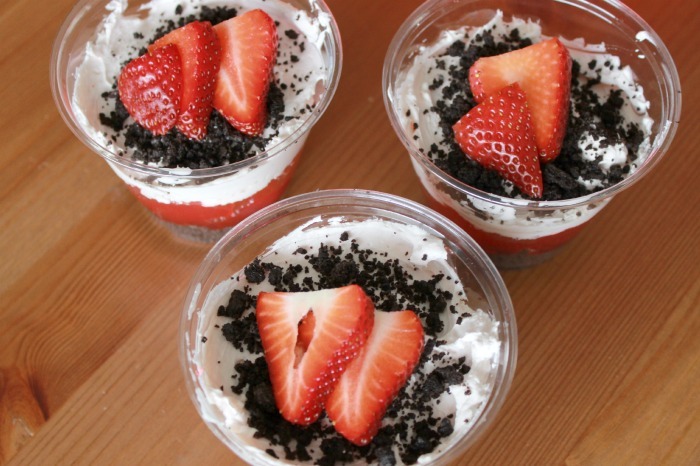 Spread the cream cheese mixture over top of Jello/Strawberries and then top with remaining cookie crumbs.Chill overnight or at least for 4 hours. I really think you will love this dessert – so easy and delicious! « In Case You Missed It! This looks so good! I love all of the Kraft cream cheese flavors they offer too! I love everything about this recipe. The crust and topping seriously sound amazing. Love the name of the recipe too. Pulls me in! Summer…. this kinda looks good. I don’t like berries of any kind, unless blended into a smoothie. but this looks good. 🙂 pinning! mmmm! Hi Summer, This dessert looks yummy. I’m pinning it to my dessert board. This looks and sounds so good! My MIL makes something similar! 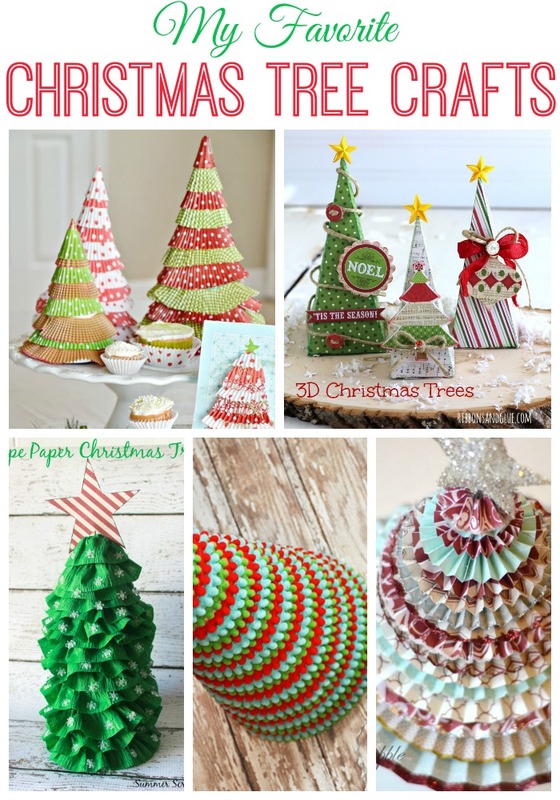 I can’t wait to make these! Thanks for sharing! 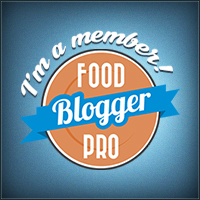 kristinethefoleyfamblog recently posted…Is Blogging Worth It? So so adding this to our grocery list! It looks SO good! amber.m recently posted…Mom wins with Blue Fairy Dust. Love strawberries in season. This looks like something my whole family will love! Deb recently posted…Would you report a neighbor for a crime? That looks so great! What a perfect recipe for summer! Oh my goodness, I want a cup of that right now! Looks delish! Lol, Im laughing, I started on one post and have read three more and another pops up. I have not seen a plugin like that before, which one is it? 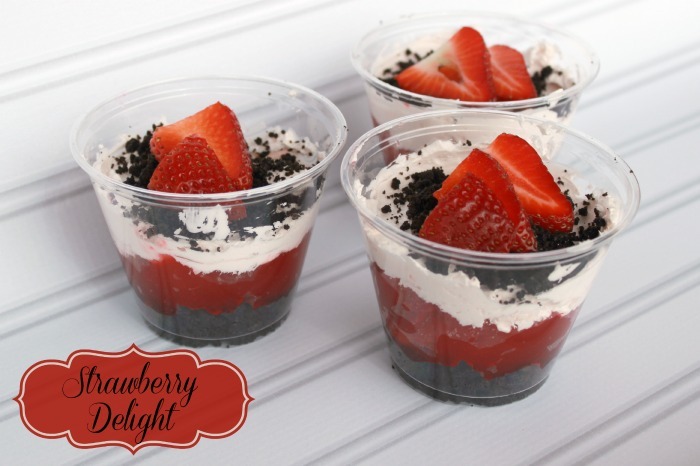 Oh and the Strawberry Delight sounds yummy, love cream cheese! !